SALVADOR, Brazil – In the hours following Germany’s apparent blowout win over Portugal in Group G the mood has shifted from joy to one of uncertainty. Following the match German goalkeeper Manuel Neuer failed his post-game drug test. In accordance to FIFA regulations Germany will be forced to vacate all of his personal achievements within the game; which unfortunately results in the four saves he had being vacated and converted to goals. Leaving the final adjusted score as a 4-4 draw. As experts begin to weigh in the expectation remains that Germany will still make it out of group play. Roman Weidenfeller is expected to fill-in as the primary goalkeeper for the remainder of Germany’s World Cup run. Joachim Löw, is hopeful that there will be no drop-off in goalkeeper performance despite the change in personnel as Weidenfeller is expected to use his additional experience to cover the gap between his and Neuer’s physical skill level. It is unclear what, if any, impact the violation will have on Manuel Neuer’s standing with FC Bayern Munich. A number of you will be attending parties this holiday season. But how can you determine how formal the event is? In advance? Impossible. It is impossible to ever know before attending the event. Even during the party it can be difficult to tell. 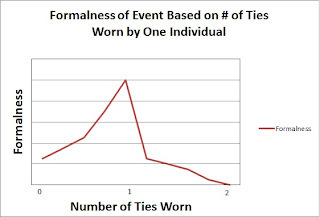 But here is a trick: Look at the number of ties the average male is wearing. 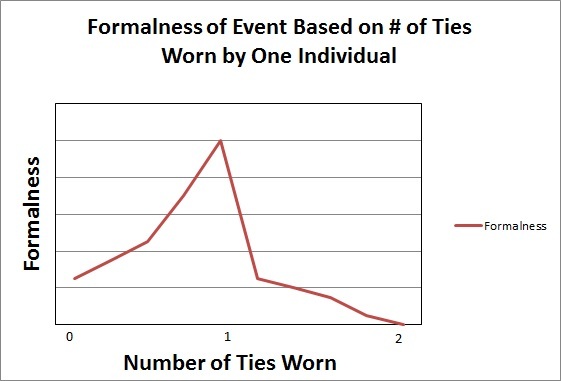 If it is one; the event is formal. If they have a loosened tie on the party may have been formal but the atmosphere is heading in a more casual direction. No ties indicate it was never overly formal. If the males are wearing multiple ties that indicates something else. Probably something great. Below is a chart to give a visual representation of this theory. Oh, you can ask. If you aren't sure how formal an event is you can ask, do that. In what has to be considered a surprise, reports have leaked linking LeBron James to signing with New York. This will leave the Cavaliers decimated as they will go from the class of the East to almost certainly a bottom dweller. The deal seems to be odd on the surface but it will give LeBron access to the New York market and should turn out to be the most overall profitable deal for him. He will receive a 7 year/$150 million deal and be assigned to AA Trenton Thunder. James’ contract is believed to hold a clause requiring the Yankees to call him up in September when the rosters expand. General Manager Brian Cashman called him an “extraordinary athlete” that “any organization would be lucky to have.” Cashman also cited that part of the Yankees evaluation process takes into account how well the player in question can be expected to adjust to the pressures of New York. There were no such concerns with James who played on national television in high school and has been an international sensation since being drafted by the NBA’s Cleveland Cavaliers. The language of the contract could take some time to work out. James will not be permitted to play basketball in the first year of the contract but may play upon making the MLB All-Star team. It seems likely he will be voted in based on his fame and the Yankees fan base backing him. Upon qualifying for a return to the NBA the team that obtains his rights will have to pay the Yankees $10 million per season of the NBA contract. James would be permitted to leave the Yankees once they are eliminated from the postseason or playoff contention. It still must be worked out how the beginning of the MLB season will play out since that is crunch time for the NBA but experts don’t see the Yankees allowing James to miss the first two months of their season. The contract will also contain a partial no trade clause in which he will be allowed to choose up to 50 MLB/NBA teams that he does not wish to be traded to/bought by. LeBron cited the new challenge of baseball as the main reason he signed with the Yankees. He will have to learn a completely new sport but will have the chance to win over a new fan base. Harold Reynolds of the MLB Network, who first broke the story, has fairly low expectations of James in the 2011 season but points out that he is a gifted athlete who is still young. James does project to have moderate power given his size and athletic ability who could become a plus fielder. It is anybody’s guess as to how quickly he will take to start making contact consistently. For the Yankees this is a fairly safe investment. LeBron apparel should fly off the shelves once it is produced. The potential revenue from merchandise and from any NBA team looking to buy his services on the court should bring a large portion of LeBron’s salary back to the Yankees. Additionally the Yankees and Mets engage in an annual basketball game. One that the Mets have won five years in a row (based largely on Delgado’s post play). While nobody really knows how this experiment will go most agree that Los Angeles will land an expansion NFL team in 2015 and that LeBron will be the starting tight end. Luckily, as spell check keeps reminding me, awefull is not a word so that friendship from above is still in tact. So how did awful come to pass? In the 1800’s a fad occurred in which words would be spelt incorrectly on purpose. For example “no go” would be “know go” and the more commonly known “all correct” became “oll korrect” (OK). Perhaps that is how we got awful out of awefull. A failed early attempt in the misspelling movement, one that likely threatened to end the movement in its infancy. After the misspelling movement there was awful (formally awefull) and awesome. Awful meaning full of awe and awesome meaning the object contained some awe. “I wouldn’t describe last night as awful but definitely awesome.” The problem with awesome was that it is difficult for an object to contain some awe - you either got it or don’t (kid). Luckily (unluckily) the late 1800’s was a tough time so awful began to be used negatively for the most part. “That was awfully bad.” Over time awful picked up a negative connotation and the “bad” (or other negative word) no longer needed to be specified so the sentence above would be, “That was awful.” This falls in line with today’s usage. Awesome slid over to what awful had meant and the former definition of awesome was eliminated. And that is where we are today. So yeah I’d say the origins of awesome are a bit confus….I wonder if con could be considered a loaner word meaning with and fuse means to bring together basically so confusing would mean with together or with with? Now that seems confusing. Reports out of The Diagram, Chart, and Graph Convention in Berlin have the Venn Diagram landing the top award tomorrow. The Venn Diagram has not won in over 15 years with the Pie Chart dominating in recent years. Many experts believe this to be due to their resemblance of pizza and the increasing popularity of pies. Some of the usual luster of the event has worn off as the location has been questioned. Numerous attendees felt that Berlin was not an appropriate host city citing a lack of sufficient lodging and venues. The European attendees praised the choice for its "decidingly different feel" than the usual New York or Chicago setting when the US plays host. One British voter said that the, "experience alone was well worth the trip." A German attendee stated that they, "don't have anything like this in [his] home country." Eric Cox, a chairman on the Diagram/Chart/Graph committee, thought it would be a "neat change" to host the event in the former Nevada mining city that has long been abandoned. Cox felt that overall it was a success. "We gained some popularity and this convention has always been edgy," Cox stated. The governor of Nevada Jim Gibbons added that Berlin is an excellent reminder of the past in Nevada and much of the West at one time. Gibbons explained how Berlin was built around one industry. When the mining industry failed in Berlin, the town failed. He preached the importance of diversity in a city/state's economy. Depending too much on any one industry or even too heavily on one city (economically) leaves a state vulnerable "which is one thing Nevada will never be again. When people think of Nevada I want them to think of the wealth of industries across the state that we play home to." The Box-and-Whisker Plot once again won the Cooliest Name Award; making it 25 years straight. It appears the Redskins will be employing a running back by committee style for the remainder of the season. Quinton Ganther will be picking up the start in Oakland but look for Cartwright and Smith to get touches too. Rock Cartwright started the season off as the main kickoff returner but has seen his role on offense increase as the team's other tailback options have dwindled. Hunter Smith began the season as the team's punter but his dynamic play making ability has thrust him into the middle of Washington's continuously evolving running back situation. Going into the home stretch of the 2009 season Smith is one rushing touchdown away from tying Ladell Betts for the team lead and is in sole position of second for passing touchdowns to Jason Campbell. The team would have liked to get Smith carries weeks ago but had to hold off with the uncertainty of Chris Cooley's (TE/P) return date from his broken ankle. As the team's only punter subjecting Smith to the hits he would have taken would have been irresponsible. Suisham averaged only 26.7 yards/punt this season before he was replaced with Graham Gano. Zorn appears confident in Gano's ability to replace Smith in the punting game if something were to go wrong. Expect Hunter to stay in the committee for the rest of the season unless Campbell struggles/gets hurt. His performance against the Saints appears to have solidified his chances of closing out the season as the team's top QB. Indications out of Ashburn are that if Campbell were to go down Collins would take over but Smith would pick up the first team reps in practice and get the nod the following week. Zorn said, "Hunter gives us a bit of a different look at quarterback. We would instantly become a threat to punt on any down, not just fourth. That is tough to game plan for on the defensive side...I would think." Personally I thought they showed enough in a short first season to give this show another go around. And I have to applaud Comedy Central choices last summer in giving the Michaels, Daniel Tosh, and Demetri Martin shows. Tosh saw his first season extended by the network and Important Things was picked up for a second season. No word on Michael and Michael...yet. Clearly I am no expert of neurophysiology or television, so I have no idea if the show will be picked up or not. But if it is I know exactly how the following seasons will go. Season 1: In the books, go watch it if you haven't. Season 2: Mainly unchanged from Season 1. Demetri Martin will appear in the show (as will the Michael's in his show). David Wain makes a guest appearance, much to their characters' chagrin. To make matters worse Biederman announces in the season finale that Wain will be offered a featured role on the show due to his appeal to the 18-34 female demographic. Season 3: After months of waiting it turns out Wain took the network up on the offer and joined the show. For the first half of the season the Michaels try to trip Wain up; until he proves himself by stealing Biederman's MP3 player in the episode entitled "Biederman's Fury". SPOILER ALERT: They sneak it back into his office after his increased ability to hear stops most of their capers before they get off the ground. Season 4: A plot driven season. Michael Showalter's character, Michael, is forced into moving in with Michael Ian Black's family. Of course some ground rules have to be set up after Season 1's incident. I won't ruin it but let's just say Kumail is heavily involved. Showalter's presence leads to a strain in Black's marriage as they have been increasing goofy and David Wain is always not to far off, often bringing a different lady friend back to Black's place which he attempts to play off as his own single family home. His explanations of the pictures range from quite good to just absurd to completely honest. The honest one is less of a success. At the very least Wain's style rubs off on the other two and their wardrobes vastly improves within the show. But I digress. Black and Mrs. Black separate (in the show, ONLY IN THE SHOW) and it leaves Black and Show looking for a place at the end of season 4. Season 5: The first episode revolves around Michael and Michael looking for a place. The network has put their show on hold and money has suddenly gotten tight for the crew. They finally find an apartment but they need a third room mate to make rent. Wain steps in to save the day and they sign the lease with a German land lord. Episode's 2-11 of Michael and Michael Have Issues will be Episodes 1-10 of Stella's first season. Season 6: Stella Season 2. Stella set out with the goal to get the second season of their show aired. And they will succeed about one decade later; as long as Season 2 of Michael and Michael is picked up.